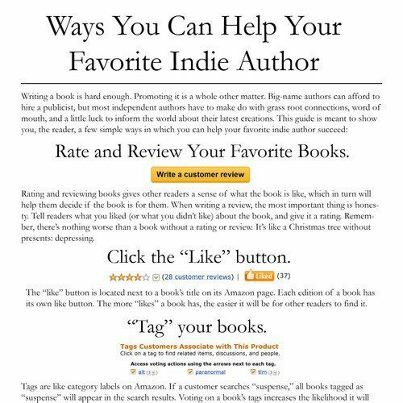 I recently saw (and shared) the graphic that appears below, “Ways You Can Help Your Favorite Indie Author,” and it got me to thinking: if you really enjoyed a book and want to see more books from the author, then you probably do want to help them. But not everyone knows h ow or has the time to search out all the various avenues that you can use to support their favorite author. So I’ve compiled a list, naturally using me as an example. But you can use these ideas to support any author, not just me. And while the graphic concentrates on Amazon, my list contains ideas and links to other sites as well. Some of these suggestion might take a little time, but most take just a few minutes or even just a few seconds. Liking Small Things on Amazon, for example, would take less than 15 seconds of your time (yes, I timed it) and will help encourage Amazon to promote the book. Unlike, say, Stephen King or J.K. Rowling, your favorite indie author probably doesn’t have a contract with a huge publishing house. If you want to see more of their work, support them not only by buying the book but by recommending the book to others via any of the suggestions above or by anything you’ve thought of that I haven’t. After all, word of mouth is still the best form of advertising. This entry was posted in General and tagged amazon, book, derouen, facebook, joe, novel, rate, review, small, things, twitter. Bookmark the permalink. The dreams, she imagined, were just her mind’s way of trying to make sense of a traumatic, life-altering situation. But this memory, the memory of the hotel room in Florida, and her indiscretion with a man who wasn’t her husband, that was real.